Vast Public Indifference: Take the Nickname Quiz! Regular readers know that I am a great lover of all things name-related. 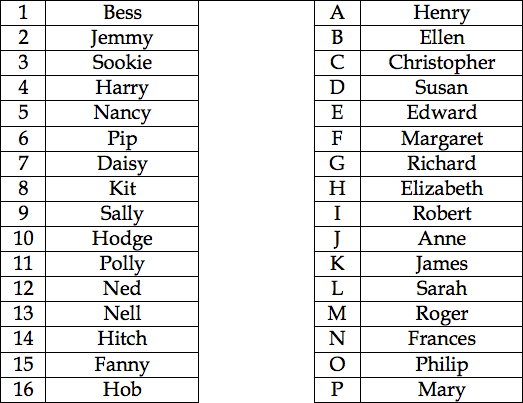 The list of names I would want to use for my own child is so extensive (and, some would say, eccentric), that it is a miracle that Pete and I have been able to narrow it down to a single first and single middle name. During the decision-making process, I have been frequenting a baby naming forum where people share their names and offer feedback on other posters' suggestions. One thing I have found surprising is that many people are unfamiliar with the traditional nicknames for common English names. Often, a poster will suggest a name like Maggie as a full name and then express surprise at learning that Maggie has traditionally been a nickname for Margaret. Giving children nicknames as given names is not a new phenomenon — the Social Security list of the top 100 names of 1900 is full of Willies, Annies, and Charlies. What I find surprising is the tendency to come up with new names to accommodate nicknames, rather than using the traditional full name. For example, Jack has become very popular recently, but many modern parents prefer it as a full name on its own or a nickname for Jackson (or Jaxon, or Jaxson), rather than as a nickname for John. Post your score in the comments. Don't feel bad if you didn't get them all — I had to look up a couple just to be sure. I got 13 correct and should have gotten 14 - a senior moment of forgetfullness on one. But I'm pleased with that score! When we were expecting our child -- we chose not to know if the baby would be a boy or a girl -- we found that we had to simply cut off all discussion of names with friends and family, and intentionally chose a first name that no one on either side had. We didn't tell anyone, either, so no one knew until we announced it in the delivery room.